Ponto de Encontro Restaurant is the perfect place for big groups of families and friends wanting to enjoy a rich, delicious meal composed of sea food specialities, mostly. Located right in the heart of Tavira, as many others do, Ponto de Encontro Restaurant is definitely the place to go if you would like to taste one of their many traditional fish dishes, while enjoying their terrace on sunny days. When it comes to great, hearty food, Ponto de Encontro Restaurant has the perfect setting going on. The Sea Gastronomy Festival has been held here for many years now, which is usually why visitors line up to get a seat. 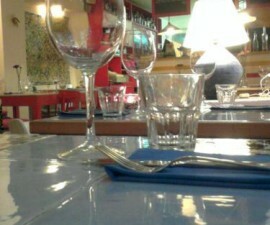 The menu boasts a varied palette of sea flavours, such as tomato soup, piri-piri grilled prawns, tuna or chicken salad. For mains, the menu is quite simple and short, which brings out the idea that quality is put in first place instead of quantity. This is a major advantage at the Ponto de Encontro Restaurant and what truly gives it its success. As far as fish dishes are concerned, specialities are fried sole fillets with almonds, fried sea bass fillets with thyme sauce and lemon, grilled sea bream, tuna fish steak ‘Tavira style’, grilled sword fish steak ‘Algarve style’, and grilled salmon. These cost between € 9 and € 14 per person and are always served with salad and boiled potatoes or French fries. The sea food is also a must here at the Ponto de Encontro Restaurant, a true rendezvous of delightful flavours. Cataplana with cockles, prawns, pork fillet, stewed mussels for two (€ 35), monkfish Cataplana with cockles and prawns for two (€ 35), seafood rice for two (€ 26) and monkfish rice with prawns and cockles for two (€ 26). As for meat dishes, they serve the best of the best. Beef steak with almonds sauce, pepper steak, grilled beef chop, fillet mignon with fresh mushrooms sauce, turkey steak with fresh mushrooms sauce, pork fillet with onions and Porto wine, and grilled chicken breast. Prices range between € 8 and € 14 and the dishes are always served with vegetables and French fries. As we mentioned before, the Ponto de Encontro Restaurant is the perfect place for bringing your family and have a nice, lovely dinner together, tasting what Tavira has to offer. Thinking of that, they put together a special children’s menu, which consists of sausage with French fries and fried egg, fish fingers with French fries, and chicken nuggets with French fries, costing all € 4. Let us not forget about the dessert list, which comes with some of the most traditional sweets in the Algarve, such as the almond cake and cheesecake. The wine list is also known to be plentiful and organised, setting up the perfect conditions for lunch or dinner well taken care of. There you can find an array of beautiful, rich wines from the Algarve region, but also from other regions in Portugal, such as the northern region of Minho, Douro and Dão, and the southern region above the Algarve, Alentejo and Setúbal. There is also a bar set apart from the main restaurant room, where you can enjoy an evening drink or while you wait for your table to be set. 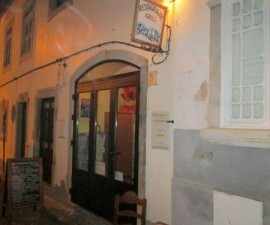 Ponto de Encontro Restaurant is definitely a place with history in the lovely town of Tavira. Over the past 30 years, the team at the restaurant has been working very hard to serve up the best food there is while adapting to modern days. Here is also where a number of Portuguese celebrities and public figures have been coming to indulge in amazing sea food dishes and just have a great time, so this ends up being an advantage for the restaurant’s recognition. During the summer months, and even after the Sea Gastronomy Festival, the restaurant tends to get a little bit busy, so it is advised to book in advance or arrive way before 8 PM. If you choose a table outside, make sure you select one as far as you can from traffic, as the terrace is set up on the street. Having a tasteful meal with a view over the town main square is rather enjoyable and unique, although Tavira is keen on providing such scenarios. So, if you are visiting Tavira in a near future, prepare your reservation right away and prepare to be amazed by the airy space, the delicious food, the helping and enthusiastic staff, the terrace overlooking the main square town and altogether the whole atmosphere. Definitely a good value place in Tavira you will hardly forget.